Polymer composite films based on poly-vinylpyrrolidone (PVP) doped with different copper concentrations in 1 % HNO3 were prepared using the solution cast technique. The polymer films were subjected to 60Co γ-ray source at various doses ranging between 100 and 400 kGy. 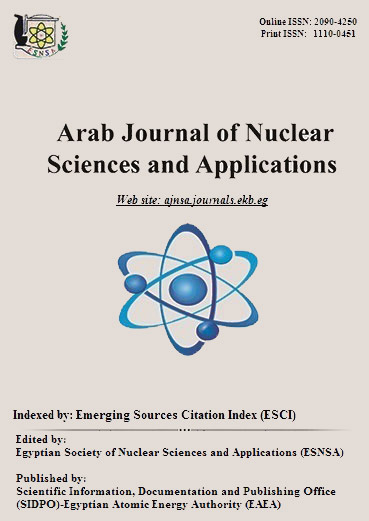 The effect of Cu ions concentration and g-irradiation doses on the physico-chemical properties have been investigated. FTIR spectra gave information about vibration changes that occurred due to copper dopant and g-irradiation doses. XRD results indicated that the amorphous domain of the PVP polymer matrix was increased with increasing of the dopant concentration. The surface morphology was examined (SEM). Theelectrical conductivity was increased with the increase of the Cu dopant concentration and g-irradiation dose. The direct and indirect optical band gap values were decreased to 3.09 and 2.84 eV respectively as the irradiation dose wad increased to 400 kGy.